I love the image of Saber you used :D The background looks too blurry though. Too much blur in general, actually. Try sharpening the background and not so much blur in Saber's hair. Overall, it looks pretty good ^^ Keep it up! Saber is so fukin cool. 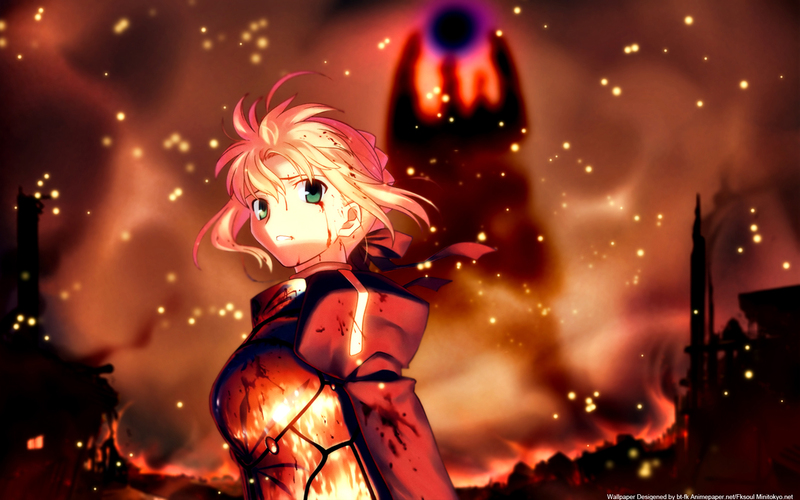 I love Saber and this image is wonderful, the BG is great, all is great. love the scan of saber used! + the background really fits the whole style of the scan with something destruction + some flames! XD and double love with a widescreen version! ;) +fav! But this image is wonderful. I like a lot the wall! I like the effects and all! yeah...the artist uses the best novel cover that i've seen this year..
^^ Nice Saber wallpaper wow. One thing is bugging me though, there's a white line along the left edge of the image. ...... Nice ........ have nothing more to say. Good job man. Love this sooo much. This kind of wallie makes people want to watch the series. I know cause it did that for me. :p Adding to favs, thanks for share this! The colouring on her skin is so lovely, very firey and realistic. XD Just beautiful. much blur in general, actually. Try sharpening the background and not so much blur in Saber's hair. Overall, it looks pretty good ^^ Keep it up!